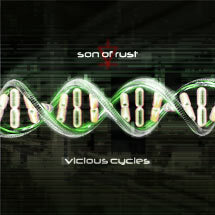 SON OF RUST is the Portland-based solo project by Justin Coope, who likes to present us his already second and self-released full-length CD. Surely not at all a bloody greenhorn, since Justin could already open some events mostly in his area for global scene-players like A23, INFORMATION SOCIETY or IRIS. Also a strong friendship on MySpace and several playlist entries speak for his growing rule in the Industrial scene. Musically "Vicious Cycles" offers an electronic-driven outfit being infiltrated with some Rock-like guitar sounds and Justin’s charismatic vocal performance. Synth-/Futurepop with edges, luckily without the plastic-sugar-sweet-kind – so it can be named, too. The given references on DEPECHE MODE, MESH, IRIS, NIN and/or IMPERATIVE REACTION aren’t to far away from topic, I also tend to compare especially Justin’s timbre with the non-effected voice of Gary Zon (DISMANTLED), while Justin is definitively more talented. 12 quality tracks following some fine compositional guide lines without any filler are presented here. However, some favorites like "Welcome To Chaos", "Just Once" or "Another Beautiful Tragedy" have to be named to be the best danceable tunes, while the mid-tempo pieces like "The Highest Cost", "Violator" (what a title...) and the majestically "To Be Free" totally convince and proof Justin’s fine nose for a needed catchy composition. Even if this release is a self-produced one, it has to be praised for its kind, sound and the good artwork printed in a digi-pack. This is a fine and constant good release for the Synth-/Alternative-Pop genre, thumbs up!